Eastern Emeralds Online Slot - ▶️ Play & Win up to 1680x Your Bet! Take a trip to the distant Orient and uncover all of the riches it has to offer. Try your luck on Eastern Emeralds by Quickspin and you could walk away with a small fortune. The slot has a lot to offer in terms of payouts and free spins features. With its Wild Multipliers and 4 different free spins options, this slot is sure to keep you spinning for a long time. Eastern Emeralds is a 5-reel, 3-row, 20 paylines slot. 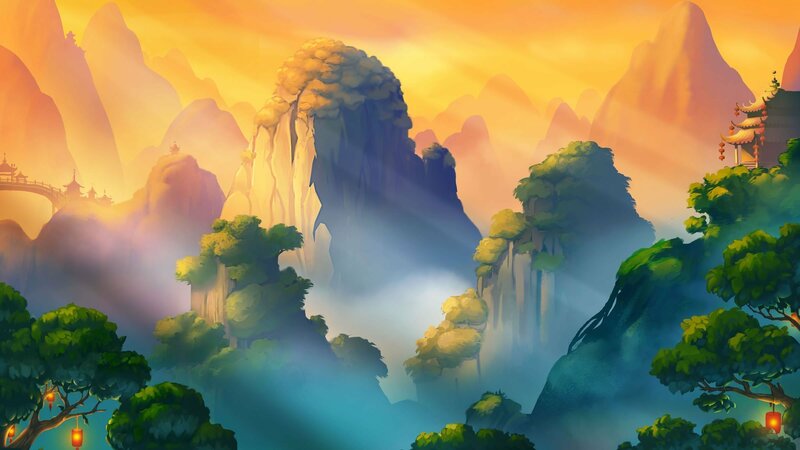 The game is inspired by the beauties of the distant Orient. The visual details in the slot are amazing. The Quickspin designers really did a great job with the animations and the choice of colours. The reels are set high in the mountains, with soothing music in the background. Playing the game is incredibly easy. Since the payline number is fixed, all you need to do is set your bet size and hit the Spin button. During base play, the goal of the game is to get as many Wilds on a winning payline as possible. Each Wild comes with a multiplier so the more Wilds you land, the higher the win multiplier will be. But the biggest payouts come from the free spins rounds, where you can get some massive multipliers. There are 10 regular game symbols which can land on the reels of Eastern Emeralds. The highest payout comes from the Dragon symbol, awarding a payout of 7.5 times the total stake for landing 5 of them on a winning payline. The rest of the high paying symbols are the Koi Fish, Turtle, Golden Bowl and Coins. The low tier symbols in the game are the card symbols which range from 10 to A. The Special Symbols in the game are the Wild, the multiplier Wild and the Bonus symbols. The Wild can land on all of the reels and can substitute for all other symbols, except for the Bonus symbol. Three Bonus symbols will trigger the Destiny Bonus when they land on reels 2, 3 and 4 consecutively. The Wilds are a big focus of the game and when a Wild lands on a reel, it can land as a regular Wild symbol or as a Multiplier Wild. Each Multiplier Wild will come with an attached multiplier of x2, x3, x4 or x5. If two or more Multiplier Wilds land on a winning payline and contribute to a winning combination, the attached multipliers will be multiplied. In this way, you can score some quality payouts even during base play. Still, the real excitement in the slot begins when 3 Bonus symbols land on reels 2, 3 and 4. This will trigger the Destiny Bonus where players can choose one of 4 different free spins features as described below. Eastern Emeralds does not have a bonus round, such as picking treasure chests or spinning a wheel of fortune, etc. It would have been nice to see a unique bonus game, but the free spins make up for this. Once the Destiny Bonus is triggered, you will need to choose among four free spins offers. You can choose to play 6, 9, 12 or 15 free spins. The lower the number of free spins, the higher the payout potential is and vice versa. If you choose the 15 free spins, the Wild Multiplier can go up to x5 with a potential payout of up to 1680X your bet; in the 12 free spins, the Wild Multiplier can go up to x6; in the 9 free spins, the Wild Multiplier can go up to x7, while in the 6 free spins, the Wild Multiplier can go up to x8. The highest Win Multiplier will always land on the last reel, while the lowest (x1) will land on the first reel. This way, you will need a decent 5 of a kind win, with at least two Wilds involved in order to walk away with a big payout. Eastern Emeralds doesn’t have any Jackpots attached or a progressive jackpot. Still, players can win some really big payouts during free spins with the Multiplier Wilds. Eastern Emeralds is a fixed 20 payline video slot, so there is no need to adjust the number of paylines. Just set your bet size and start spinning. Eastern Emeralds comes with an RTP value of 96.58%, which is a solid value for a video slot. The volatility of the game is set as low to medium. This means that players can expect some frequent smaller payouts during base play, but also some great wins in the bonus round. Quickspin has a lot of great games in their portfolio and Eastern Emeralds is certainly one of them. The game may not have a progressive jackpot attached or a bonus game, but players can still win some serious cash, especially with all the Multiplier Wilds. 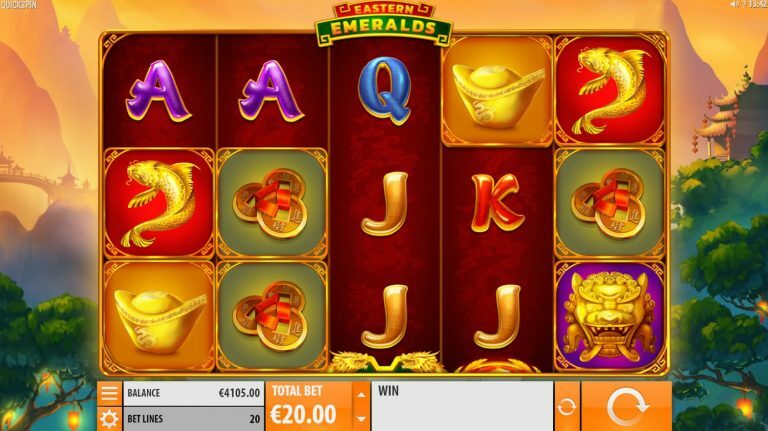 Playing Eastern Emeralds is entertaining and provides for a good mix of regular payouts and free spins payouts. Take Eastern Emeralds for a spin right now at Casumo!